The Freedom Pass for disabled people gives free travel on most of London’s transport services 24 hours a day for eligible residents. Free travel on National Rail from 9.30am Monday to Friday and all day weekends and public holidays. Most disabled pass holders (other than those issued with a discretionary pass) will be entitled to free travel on local bus services in England outside London between 9.30am and 11pm Monday to Friday, and all day at weekends and on public holidays. People who are profoundly or seriously deaf. People who are without speech. People with a disability or injury which has a substantial and long term adverse effect on their ability to walk. People without arms or long term loss of use of both arms. People with a learning disability defined as 'a state of arrested or incomplete development of mind which includes significant impairment of intelligence and social functioning'. People who, if they applied for the grant of a licence to drive a motor vehicle, would have their application refused on the basis of physical fitness, but not on the ground of persistent misuse of drugs or alcohol. In addition Richmond Council has agreed to the issue of passes to some applicants with a mental health need. Disabled Persons’ Freedom Pass applications should be sent to the Supported Travel Team who assess people for eligibility onto the scheme. We will assess your application and, if you qualify for a pass, your Freedom Pass will be posted directly to you. Download our Disabled Persons Freedom Passes application pack. (You can also read our Personal Information Policy). Existing Freedom Pass holders who lose or damage their cards will be charged £12 for replacements. You can request a replacement pass online. If you already have an account you can log in, pay the £12 replacement fee and request a replacement in your account. If you do not have an account you can create one. Contact the Freedom Pass Helpline on 0300 330 1433, Monday to Saturday from 8am to 6pm. Email info@freedompass.org to request a replacement pass. Once payment has been received and confirmed you should expect to receive your replacement Freedom Pass in the post in three to ten working days. FREEDOM PASS RETURNS (No stamp required). You are not allowed to hold more than one concessionary pass at any one time. Only use the most recently obtained pass and return any others. If you are turned down for the scheme, you have a right to appeal. The appeals procedure (pdf, 106KB) outlines the two stages of appeal. The Appeals Sub-Committee procedure (pdf, 156 KB) outlines what you can expect from a stage two appeal hearing. The guidelines for the determination of a stage two appeal (pdf, 188KB) explains how the final decision is made at a stage two appeal. 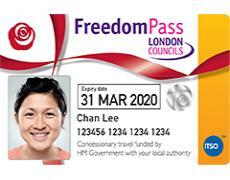 For information about the Disabled Persons Freedom Pass Scheme, contact us by telephone on 020 8831 6312.